Denzel Washington's reunion with Spike Lee put them on the inside track at the box office. 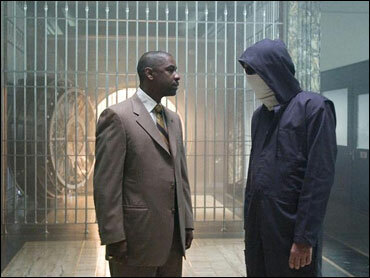 Their bank-hostage thriller "Inside Man," an unusually commercial project for director Lee, debuted as the No. 1 weekend film with $29 million — the best opening ever for both the filmmaker and his star, according to studio estimates Sunday. Universal's "Inside Man" knocked off the previous weekend's top movie, the Warner Bros. action tale "V for Vendetta," which slipped to second with $12.3 million. "V for Vendetta" raised its 10-day total to $46.2 million. Disney's fright flick "Stay Alive," featuring Frankie Muniz in a tale about a video game that brings death to its players, premiered in third place with $11.2 million. The weekend's other new wide release, Lionsgate's "Larry the Cable Guy: Health Inspector," a gross-out romp starring comic Dan Whitney investigating a food-poisoning outbreak, opened at No. 7 with $7.05 million. Stung by declining revenues over the last year, Hollywood broke out of its latest slump, with the top-12 movies grossing $98.9 million, up 10.6 percent from the same weekend a year ago. The upswing followed a month of declines. The solid weekend was a prelude to this Friday's debut of the animated sequel "Ice Age: The Meltdown," considered an early lead-in to a summer season that launches with Tom Cruise's "Mission: Impossible 3" on May 5. "This was a good kickoff to what I think will be a pretty good run leading up to summer," said Paul Dergarabedian, president of box-office tracker Exhibitor Relations. "Inside Man," starring Washington, Jodie Foster and Clive Owen in a story of cops against robbers during a Manhattan bank heist, exceeded box-office expectations for distributor Universal, which had figured on a $20 million weekend at best. Lee and Washington's earlier collaborations include "Malcolm X" and "He Got Game." At $29 million, "Inside Man" topped Washington's previous best opening weekend of $22.8 million for "Man on Fire" and Lee's previous best of $11.1 million for "The Original Kings of Comedy." Two-thirds of viewers for "Inside Man" were older than 30, a promising sign for Hollywood, whose key audience of young males has been less inclined to go to the movies with so many other entertainment distractions such as video games and DVDs. "They were motivated to go. They love the material, they love the actor," said Nikki Rocco, Universal's head of distribution. "It's the motivation to get them to go to the movies, and I hope that we as an industry keep that up. If we want the business to survive, we have to continue to find ways to motivate them." "Inside Man" also took in $9.6 million over its opening weekend in 18 other countries. 1. "Inside Man," $29 million. 2. "V for Vendetta," $12.3 million. 3. "Stay Alive," $11.2 million. 4. "Failure to Launch," $10.8 million. 5. "The Shaggy Dog," $9.1 million. 6. "She's the Man," $7.4 million. 7. "Larry the Cable Guy: Health Inspector," $7.05 million. 8. "The Hills Have Eyes," $4.25 million. 9. "Eight Below," $2.7 million. 10. "16 Blocks," $2.2 million.